Dinner will begin 6:00 p.m. so little ones will not have to stay up too late. 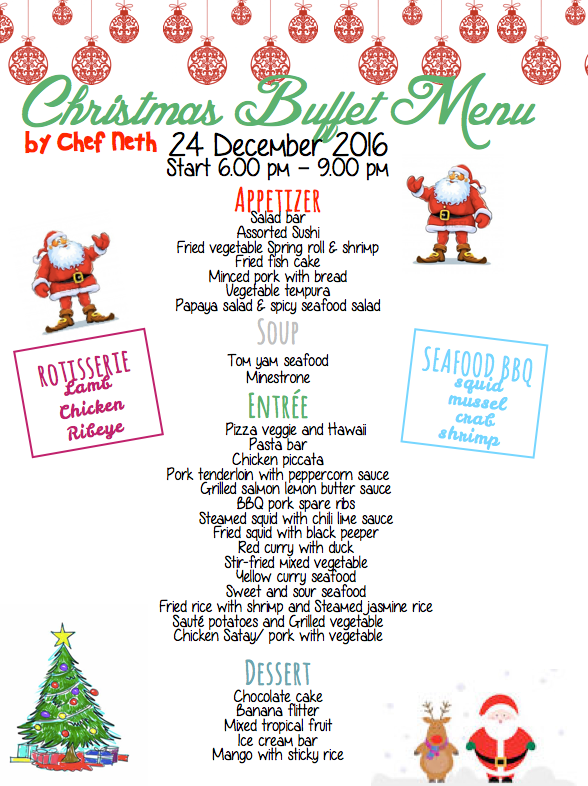 You can reserve your table at the Front Desk starting December 22nd. Outside guest are welcome to join. We have reliable information that Santa Claus is coming to Dolphin Bay Resort later in the evening! Attention all Mothers and Fathers: Santa has asked that all mothers and fathers wrap one small gift for each of your children and label it with their first and last names and room number. Santa will call out each child’s name and give the gift during his visit. ***Please kindly give the gifts to the reception desk before 3 p.m. on Saturday, December 24. We look forward to celebrating this special day with you! Happy Holidays!